Molecularly imprinted polymer (MIP) microspheres with diameters in the range 60–500 μm were synthesized in a continuous segmented flow microfluidic reactor and used as packing material for microtraps for the selective separation of benzo[a]pyrene (BAP) from environmental aqueous samples. The synthesis involved the pumping of monodisperse droplets of acetonitrile containing methacrylic acid as the functional monomer, BAP as a template, and ethylene glycol dimethacrylate as the cross-linking monomer into the microchannels of the microfluidic reactor. The microspheres showed high adsorption capacity and selectivity for BAP in aqueous solutions; both are important for the environmental monitoring and analysis of BAP. The adsorption capacity for BAP of the smallest MIP microspheres (size range 60–80 μm), prepared as part of this study, was 75 mg g-1 in aqueous solutions; furthermore, this adsorption capacity was close to 300 % higher than that of commercially used activated carbon. 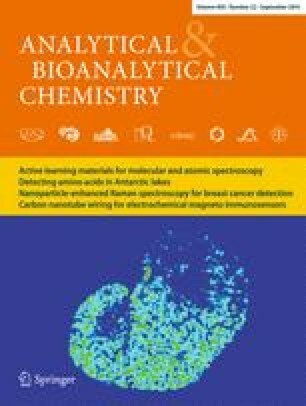 Microtraps packed with MIP retained BAP intact for at least 30 days, whereas microtraps packed with activated carbon for BAP showed 40 % reduction in BAP concentration for the same period. This study has demonstrated that MIP microtraps have significant potential for the selective enrichment and preservation of targeted polycyclic aromatic hydrocarbons from complex environmental samples. R.J.K acknowledges financial support from the Council of Scientific and Industrial Research, New Delhi, and the Planning Commission, Government of India, under the Molecular Environmental Science and Engineering Research program.